One thing we heard a lot throughout the Olympics coverage was the medal count. At the end of every day, NBC would flash up its graphic and Bob Costas would tell us that the U.S. or China was in the lead. Every time that happened, my demographer hackles were raised. Turns out, reporting on Olympics medal statistics is a lot like reporting on Virginia statistics. If the VA media chose to report just raw numbers as measures of success, they would pretty much always conclude that areas of Northern Virginia are doing the best. Those areas have more educated people, more professional workers, more people moving in, etc, but a lot of those statistics are just driven by an underlying population that is much larger than that of localities in other parts of the Commonwealth. Reporting just the total medal count in the Olympics makes it look like the U.S. and China are the most successful at the Games. But are they really? The U.S. doesn’t even appear in the top 10 using this mechanism for measuring Olympics success! However, this isn’t the only way to look at the medal count. 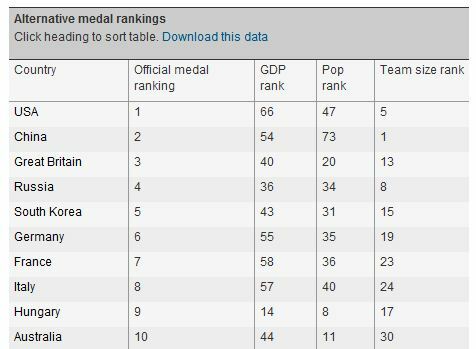 Garry Blight and Simon Rogers put together an interactive table where you can view the medal count based on separate indicators: country population, GDP, and Olympics team size. Turns out, based on these alternative measures too, the U.S. didn’t run away with it. While officially the U.S. earned more medals than any other country, the U.S. ranked 66th in medals earned in terms of GDP, 47th in medals earned in terms of country population, and 5th in medals earned in terms of team size (in this analysis they did weight gold medals more heavily than silver, and silver more heavily than bronze). My change did make quite a difference in the rankings. My guess is this finding is mostly stemming from the nature of the team sports and the countries in which they are popular, but it was fun to look at the data in a different way nonetheless. 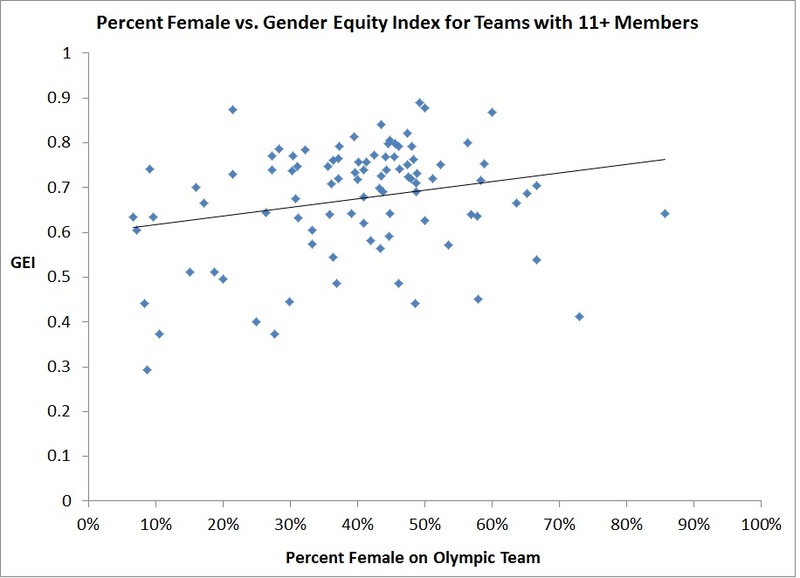 Female representation on the Olympic teams is on the x-axis and the Gender Equity Index is on the y-axis. Larger values of the Gender Equity Index represent higher gender equality in that country. This plot (along with a regression analysis I ran separately) shows that the Gender Equity Index is a significant predictor of female representation. Countries with more gender equality are likely to have a higher proportion of females on their Olympic team. My exploration into alternative measures of success was fun and interesting, and I got to learn some new things. I was pleased to see that, although not a part of NBC’s primetime coverage, there are a lot of people out there exploring this data in meaningful ways. Looking more deeply into the numbers is an important exercise whether we’re looking at fun data about the world’s greatest athletes or data with more important implications, like those that tell us how Virginia’s residents are faring.